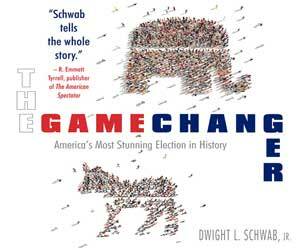 Home USA Politics What’s With the California Legislative Jewish Caucus? What’s With the California Legislative Jewish Caucus? 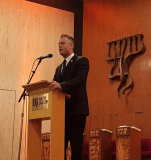 Legislator Travis Allen introduced California bill AB-1552 to squash the BDS movement. 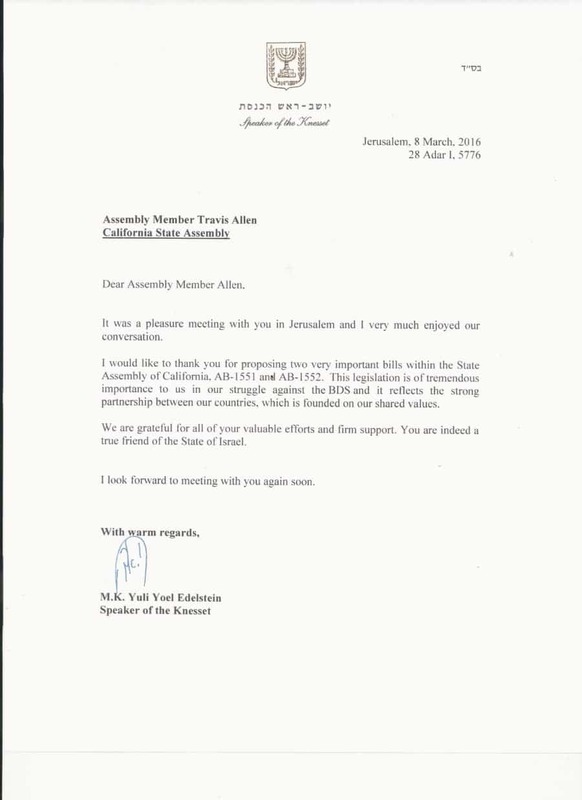 That sounds good, but what’s going on with the California Legislative Jewish Caucus? Joint-Author of the AB 1552 bill is Assembly Member Richard Bloom, a Democrat and a member of the Legislative Jewish Caucus. I heard about the AB 1552 bill from Mr. Allen when he spoke about it at Beth Jacob Synagogue in Beverly Hills. Four weeks ago he travelled to Israel to meet with Israeli legislators, to tell them about his effort to pass the bill and get their support; and he did. It is important to emphasize that there must be bi-partisan support for AB 1552 bill, as this issue transcends petty party politics. But sadly, in this case it is not. The bill is supported by many on either side of the political aisle other than several Jewish Democrat legislators in Sacramento who do not wish to admit that the BDS is a fast growing problem in California that must be stopped. These members of the Legislative Jewish Caucus prefer to lie to themselves and the public. They are playing petty politics, rather than let the cat of truth out of the sack. They try to make believe that the vile BDS anti-Israel, bordering anti-Semitism, activities and propaganda, which could be equated to anti-every Jew behavior, now flooding all of California’s campuses and is even trickling into high-school yards and text books, is a non-existing issue. Well it is an issue. The denial by these Jewish politicians is inexplicable when the citizens of Israel who get the brunt of the BDS are part of who they are, JEWS! The California Jewish Caucus being the obstacle to pass AB 1552, rather than to unite behind it, is exasperating, as they compel the Californian taxpayer to go along with and fund the BDS movement’s discriminatory ideology. One needs to point out that the BDS has become a bi-partisan push taking place across the nation, state by state. Governor Mike Pence of Indiana passed a state BDS law, so did South Carolina and Illinois. On Wednesday, March 9, 2016, the Virginia House of Delegates overwhelmingly passed a resolution condemning the Boycott, Divestment and Sanctions movement against Israel. The resolution states that the boycott is damaging to the cause of peace. At the federal level, there is already a movement to put an end to the discriminatory BDS. California Congressman Juan Vargas (CA-D), along with several federal level lawmakers in both chambers of Congress have introduced bipartisan legislation (H.R.4514) boosting efforts at the state and local levels to combat economic warfare against the United States’ economic allies, specifically Israel that is facing the BDS onslaught. The California Legislature, regardless of political or personal background, must unite to defeat the BDS movement. Anyone who tries making this bill about partisanship is acting in complete self-interest and intent to harm. I am fully aware that conversations are still taking place among the legislators in Sacramento and much effective amendments to the bill are still being worked on. However, I and many California residents, are all looking forward to a strong bi-partisan co-authors coalition on AB 1552, especially including the full support of the Jewish Caucus. Marty Block (Chair) Senate District 39; Marc Levine (Vice Chair) Assembly District 46; Jose Medina (Associate Member) Assembly District 61; Adrin Nazarian (Associate Member) Assembly District 46; Tony Thurmond Assembly District 15; Ben Allen Senate District 26; Hannah-Beth Jackson Senate District 19; Mark Leno Senate District 11; Lois Wolk Senate District 3. One wonders why there is opposition to AB 1552 by the Jewish Democrats legislators. Is it because Mr. Allen is a Republican among the democrats’ majority in Sacramento? Is it because he cares for the Jewish State and wants to defend her? Why are legislators, in this case the Jewish Democrats, now and once again, playing politics with a moral issue and the quality of life of all Californians? For the reader’s edification and reference, I include links to the AB 1552 press release and Assemblyman Allen’s op-ed. Additionally, letters in support of Mr. Allen, which he received from the Speaker and the Deputy Speaker of the Knesset, in Israel. Israel is most valuable partner to California in the sciences, technology, medical, water technology and more. Two years ago Governor Brown signed a Memorandum of Understanding (MOU) of cooperation with Israel Prime Minister Benjamin Netanyahu, now it is the LAW of the land. Ignoring it is an act of lawlessness. When BDS-ing Israel, one is thumbing their nose at the California taxpayers saying, we are going to damage the quality of your life in California because we have a goal, an agenda, to subvert and destroy Israel. 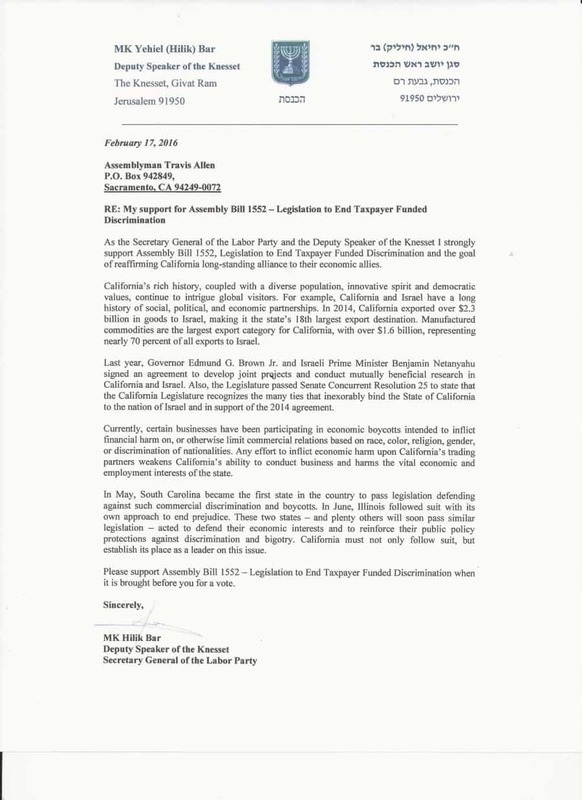 By refusing to support the bill, the California Legislative Jewish Caucus are giving a tail wind to the BDS movement. This is a moral, economic and civility case, not a political gain game. California is known to have one of the largest Jewish communities outside Israel and this community is very supportive of the Jewish homeland and most appreciative of the ties between the two states. I call on the entire Californian legislature to show true leadership, get behind and introduce the AB 1552 and by that California will join the many other states across our nation in their fight against commercial and other boycotts against Israel. I am calling on all Californians to do their part; please call your state representatives – congressman and senator – and tell them to co-author the AB 1552 bill so it passes right away. Time is of the essence. The longer the BDS movement breathes oxygen of hate toward Israel, the faster it expands. It is time to cut this ugly phenomenon’s wings for eternity.